In line with Nando’s mission to expose and champion the creative expression and development of the winners of its annual Art Initiative, a solo exhibition by Izzat bin Aziz will also be showcased at Publika from 4 – 15 June 2014. His solo exhibition themed ‘Demang Mantera’ focuses on traditional mystical rituals, or widely known as supernatural or witchcraft that still persist amongst the Malay community. A product of the National Cultural and Heritage Arts Academy (ASWARA), Izzat emerged to fame through numerous victories and prizes won in art competitions, including his recent achievement as grand prize winner in the Nando's Art Initiative 2013. 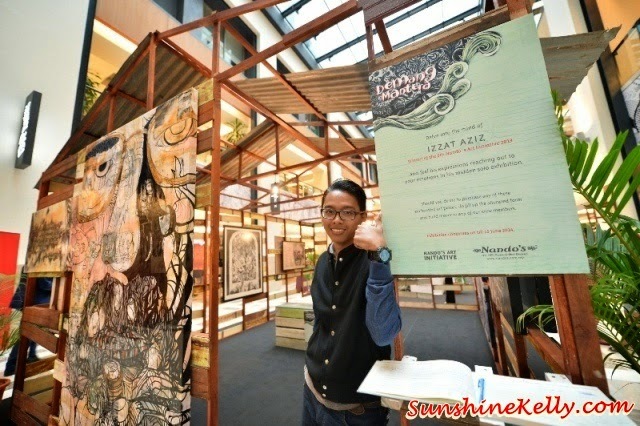 His winning piece called ‘Sembang-Sembang’ won him a fully sponsored solo exhibit to launch his career in the arts. In this collection, Izzat positions the keris as the main medium in highlighting his message. In the Malay customs, the keris plays a pivotal role, be it in the upper or lower class of the society. Nonetheless, the perspective intended to be highlighted here is the exploitations of these otherwise beautifully crafted weaponry in deviating people towards the desecration of their faith. According to the fourth edition of the Kamus Dewan, the word ‘Demang’ carries the meaning of the head of district or a title bestowed upon a chief of district, whereas Demang implied in Izzat’s art pieces refers to the Javanese dialect for a design of a hilt of keris named ‘Jawa Demang’, or more commonly known here as ‘Jawa Demam’. ‘Mantera’ on the other hand, refers to a structure of words or chants that can evoke supernatural powers or presence. It is without a doubt that Izzat’s intention is to visually highlight these blasphemous rituals in the Malay world. Izzat’s expressions in this artistic series are manifested through the usage of ritualistic elements, crafted by applying the combination of paper and canvas printing as well as painting techniques. Such works describe Malay Muslim community’s bigotry in their reliance on witchdoctors or shamans and their occult practices, although it is widely known that these sacrilegious beliefs contradict with the true teachings of Islam itself.